Greenwood Park Skating | Kids in T.O. It has been a perfect winter for outdoor skating if you can handle the chill. 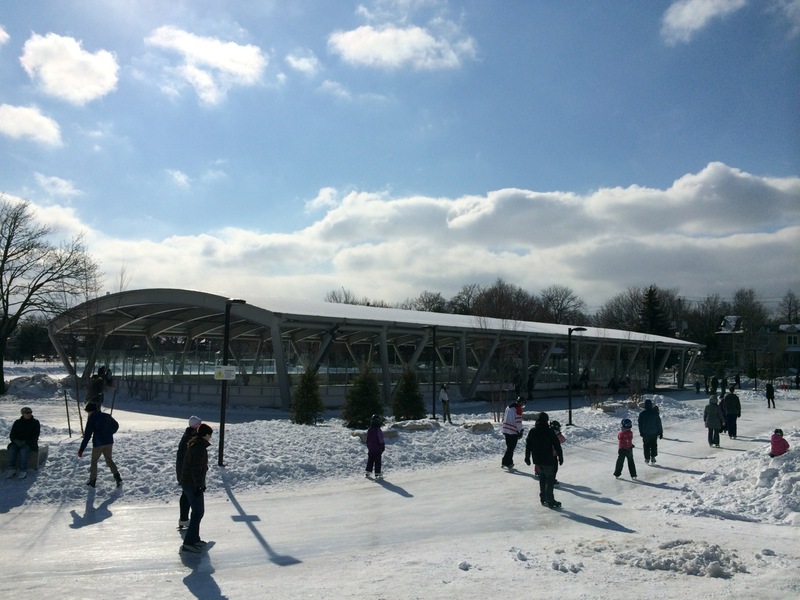 One of the new hot spots is Greenwood Park where the City unveiled its first outdoor covered rink and a new skating trail in late November. For some with Kids (in skates) in TOw, the outing on ice may last a mere four minutes. Good news – there is ample outdoor seating, an indoor change room that overlooks the trail, good climbing hills thanks to the zamboni and sledding along the park’s east side. Looking for a longer path? Head west to Colonel Sam Smith at Lakeshore Blvd and Kipling. Want to keep it local? Find your nearest rink through this map. Do it soon as the City’s 51 outdoor rinks start closing Feb 23. Some (including Greenwood) are open through to March 16. Getting there: On TTC, Gerrard Streetcar or Greenwood Bus (from Greenwood Subway.) Driving, you may be able to score some free residential parking. Helmets: Check out the City’s equipment policy before heading out. Potty time: Yes, washrooms in the upgraded change rooms. All season: We were scootering and blading in the spring and summer and we spotted some basketball nets too. Also in the hood: Warm up with some food and drinks at Brickyard Grounds at Greenwood and Gerrard.